Nhà cung cấp: Duola Tech - giá Amazon: 13.99$ - shipping rates and return policy. âˆš LIGHTWEIGHT DESIGN: Well fit and snug ergonomic design. The most recent mini bluetooth headphones that are lightweight and portable. Listen to music or sports matches secretly in anytime and anywhere, totally stealthy and invisible. 0.13 oz, light as a feather. 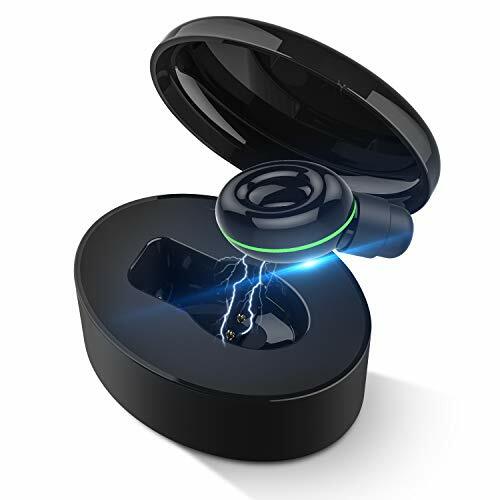 Mini earbuds can be stored in the portable charging case which allows convenient carrying and earbuds charging simultaneously. 1 Piece Earbud. 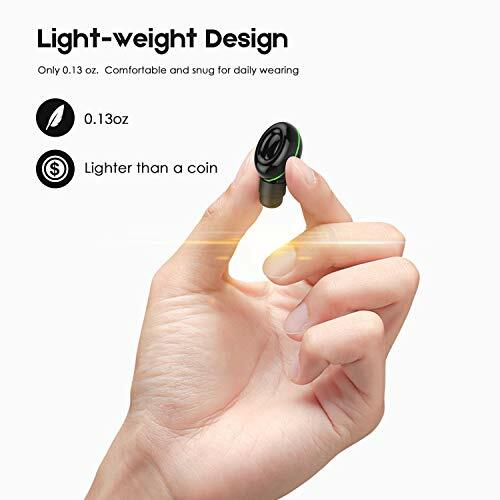 âˆš SUPERIOR AUDIO WITH BUILT-IN MIC: With premium chip and speaker, the stereo bluetooth earpiece pumps out crystal-clear bass high quality sound. Integrated HD & Sensitivity Microphone, plus Noise Cancellation technology, ideal for in-car calling that is supported by A2DP. 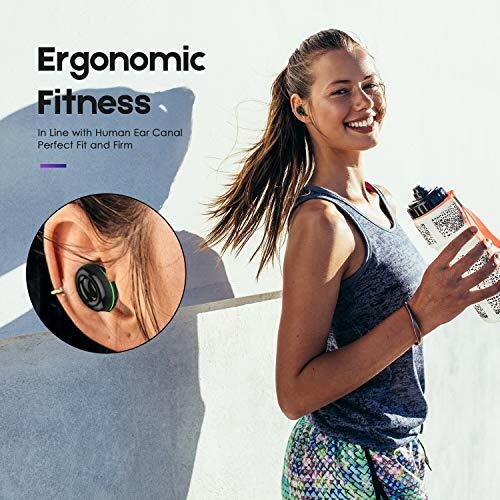 âˆš BLUETOOTH & SIGNAL DISTANCE: The most recent up to date bluetooth V4.1 and provides a fast and stable transmission speed. Can connect to all iOS and Android devices with up to 33 ft (with NO obstructions). One ear earbud design, leave One ear open to keep aware of your surroundings. âˆš UP TO 14H PLAY TIME: Headphone built in 60 mAh polymer battery. 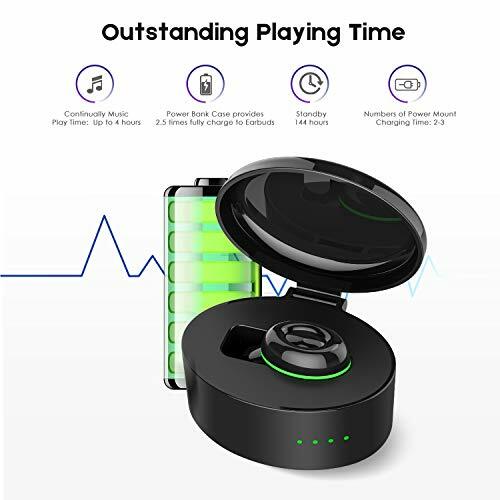 While at fully charged, can be used for up to 4 hours continuously ( depends on call quality and music type, volume). 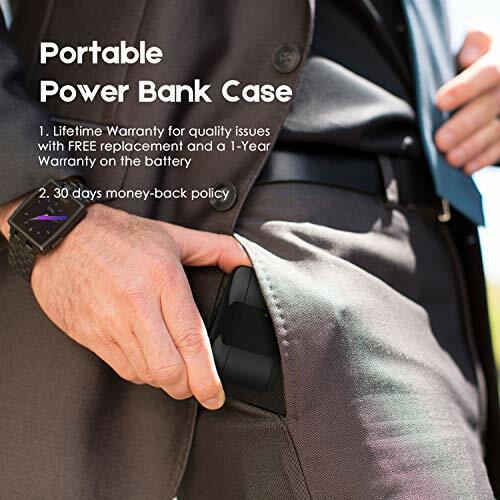 Charging case assembled 300 mAh battery, provides 2.5 times fully charge to bluetooth earpiece. Add up to 14 hours play time as per charge. REMINDER: Please press the Earbud Charging button on the surface of Charging Case for earbud charging. âˆš POST-SALES & WARRANTY: Life-time Warranty for quality issues with FREE replacement. 30-Day Money Back Guarantee. 1-Year Battery Replacement Warranty. Customer Satisfaction is our goal, and DUOLA brand stands behind their products. With free Lifetime Customer Service, please contact us with any issues so that we can resolve them. (All warranties are void for improper usage of the product).